It will be Valentine’s Day in a fortnight. Have you made your plans yet? Whether you are planning to head out for a weekend trip or a romantic dinner, it is better to start planning things in advance. You could also set the mood with handmade cards and by baking some yummy desserts for your sweetheart. You are sure to win 'brownie' points for your efforts! In time for Valentine’s Day, I have a wonderful giveaway in collaboration with Discount Supplements for my readers. 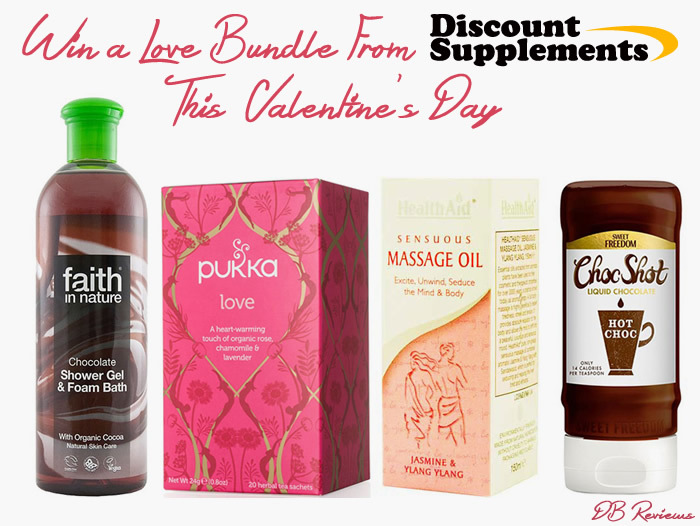 Discount Supplements, who are an online health and fitness supplement suppliers, are kindly offering readers of DB Reviews a chance to win a love bundle to make your Valentine’s extra special. Not only do Discount Supplements offer cheap protein powders, they also do a wonderful range of organic and vegan treats for body and mind! The Love Bundle that they are giving away is perfect for a romantic night in whether you are in a relationship or single! Health Aid Sensuous oil for tired muscles. Entry is very easy and via the Gleam widget below. All the best! Great giveaway! Good luck to everyone who enters.